Antonio Banderas stars as a man whose astonishing discovery threatens to shake religious understanding and tear his family apart. 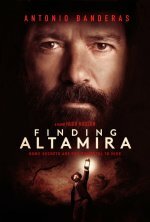 Finding Altamira release date was Friday, September 16, 2016. This was a Limited in theaters release.